We often find that turning on some music can completely change the mood of our house: kids go from complaining to dancing and singing. So here are five recommendations – oldies but goodies – that have been tested in our household, and recommended by lots of friends and family too. C.S. Lewis once made mention of a man who did not like children. Now some of our dislikes are simply a matter of taste – whether your favorite ice cream is chocolate or vanilla says nothing about your character – but this man recognized that his disregard for little ones was wrong. There is a beauty in little children, a wonder about what God has done in making these tiny new people that everyone really should appreciate. If a man doesn’t, it is because of something missing in the man. Lewis was making the point that there is such a thing as good and bad taste – all is not mere opinion. When it comes to classical music I’m like this man. I’ve never liked it, but I recognize this as a deficiency in myself. I should like it. After all, this is music that has stood that test of time. We play Beethoven and Bach’s music centuries after it was first written; does anyone think the same will be done for Lady Gaga, Beyonce, or Justin Timberlake? Even those of us who don’t like Bach know that in a real tangible way he is better than Beyonce. 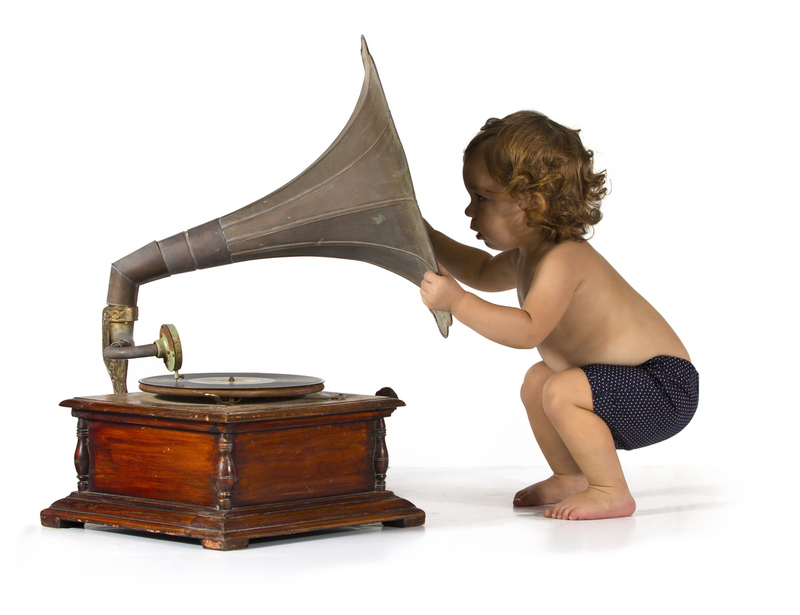 Since having kids I’ve hoped that my daughters’ musical tastes will be better developed than their dad’s. So I was very happy to come across two CDs: Beethoven Lives Upstairs and Bach Comes to Call. Each is a dramatized account of the composer’s life, sprinkled throughout with a liberal dose of their music. 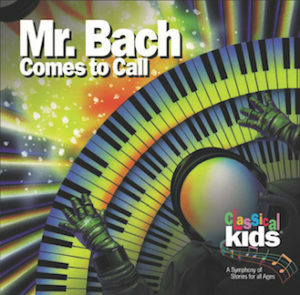 In Bach Comes to Call Bach appears in modern times, under unexplained circumstances, to a girl who is have a hard time getting her piano homework done. The composer encourages young Elizabeth by telling her the story of his own childhood and musical triumphs. 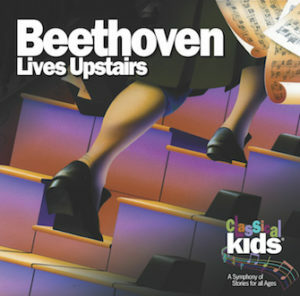 In Beethoven Lives Upstairs we are introduced to a little boy who has the misfortune to live below Beethoven’s apartment. Beethoven, it turns out, is demanding, short tempered, and makes the strangest sounds as he paces in his room. 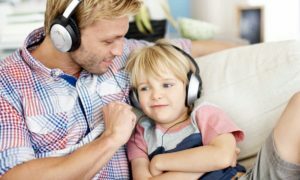 The boy airs his complaints to an understanding uncle who teaches the young boy to empathize with this great composer, who hears wonderful music in his head, but who can no longer hear it with his ears. How very frustrating that must be! A couple cautions to note. First, there is a moment in Beethoven Lives Upstairs that might lead to a little tittering. The boy complains that Beethoven was laughed at by little children who, while peering through his window, saw he was composing while wearing no clothes at all! Not a big thing, but it might have been nice to leave that detail out. Second, my wife and I have listened to other CDs and DVDs in this “Classical Kids” series and have yet to find any others we would want to recommend so don’t assume they will all be good. These two, however, are excellent, and a great way to foster a love of classical music in kids, and maybe even their dads. When I asked around for other good children’s CDs, Jamie Soles was a clear favorite with friends and family. While he has adult albums too, Soles is best known for his children’s music, which has a solid Reformed theology behind it. Some of his songs retell Bible stories, others help children memorize things like the books of the Bible, the order of the Creation days, or the names of the patriarchs. A lot of it is energetic, with a bit of a beat. The kids enjoy them all, but one of my favorites is “Run,” from the album Fun and Prophets, based on the passage 2 Kings 9:1-13, where a nameless prophet is instructed to anoint Jehu as king of Israel, and then get out of there quickly. But the time is wrong, and it’s fine for flight so…. 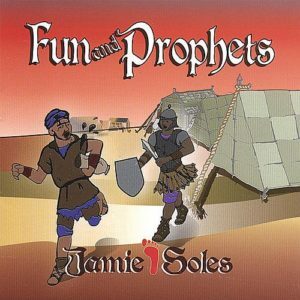 Jamie Soles has more than a half dozen children’s albums (Giants and Wanderers, Wells, Fun and Prophets, Memorials, Up From Here, The Way My Story Goes, Good Advice) all of which can be sampled, ordered, and downloaded at SolMusic.ca. He is worth checking out! As I was asking around, another name that came up repeatedly was Judy Rogers, the wife of a Reformed Presbyterian pastor, who has been making music for more than 25 years. 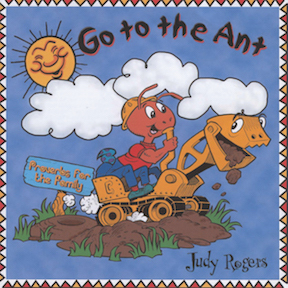 In Go to the Ant she bases most of the songs on passages from Proverbs, teaching children about the dangers of “The Tongue,” about what we can learn about hard work when we “Go to the Ant” and about the cost of attending “The School of the Fool.” The lyrics are a solid mix of fun and wisdom. A problem common to children’s Christian music is that it often strays into irreverence but that is certainly not a concern here. If you are familiar with Jamie Soles, Judy Rogers has an overall quieter sound – quite a bit less beat. Her voice is beautiful, and also contributes to the lighter sound; this is folk music that won’t be confused with pop/rock. My three-year-old daughter is a fan and, incidentally, R.C. Sproul is too. Overall I would say this is an album that kids will like, but it won’t have the same crossover appeal with parents that Jamie Soles seems to have. To hear song samples and read the lyrics, visit JudyRogers.com. The album can be ordered many places online including Amazon.ca. 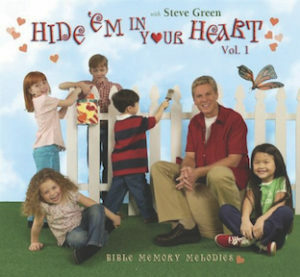 Steve Green’s music is bright and cheerful, and the words are always clear and easy to understand. Each song on this album is a verse, or two, from Scripture (either NIV or NKJV) with Green beginning each track with a short, spoken introduction. The verse is repeated at least a couple of times in each song, but Green finds a nice balance in promoting Scripture memorization and keeping the repetition to a minimum so the songs don’t become wearisome – on average each track is less than 2 minutes long. The album also features some of the very best children’s singers. The boys and girls still sound like normal children, rather than professionals, while hitting all the right notes. If I had to pick a nit with this album then I could point to a couple of the spoken introductions, where Green seems to explains the passage in a slightly Arminan-ish way. But this really is a nitpick, because kids won’t notice, and the parts your children will be singing all over your house are the verses taken straight from Scripture. I love this album because I love hearing my daughter sing “And Jesus grew in wisdom, and stature and in favor with God and men” (Luke 2:52 and Track 8). Very fun! Be sure to get the books to go along with Beethoven Lives Upstairs and Mr. Bach Comes to call. Also, though I too would not necessarily recommend all the CDs in the collection, the books we have thus far seen have been good. Tchaikovsky Discovers America is one of the books we enjoy. And if you have not tried Zeezok Publishing’s series of books by Opal Wheeler and Sybil Deucher on the childhood of composers, you are really missing out! Each book contains stories of their childhood, along with sweet illustrations which can be printed as coloring pages from the accompanying cd, which includes mp3s and sheet music. And we love all of Jamie Soles’ albums for children. Some are wonderful helps for memorization. Would recommend the Rizers (short for memorizers) for a modern and catchy sound. Each song is a bible verse. My 4 year old and 2 year old love it! We watch on YouTube and Right Now Media, and the music videos are colorful cartoons. The album is also available on ITunes.